Back cover blurb: Imagine you are having lunch at an exclusive restaurant, filled with Hollywood’s hottest stars. And a masked gunman walks in and takes everyone hostage. You must bargain for your life against a twisted individual who knows everything about you. He also has a bomb set to detonate if his heart rate changes. If he dies. You die. You have four hours to stay alive. What would you do? A heart-stopping thriller with plenty of twists and turns that will keep you on the edge of your seat, for fans of Peter Swanson, Harlan Coben and Linwood Barclay. A suspected suicide bomber holds high profile celebrities hostage at a exclusive LA restaurant. When she is out for lunch at a prestigious Hollywood restaurant, looking over one of her new clients, a suspected suicide bomber holds the restaurants clientele hostage. Terrified they do exactly as he asks and no one alerts the police. At first terrorism is suspected, ISIS or Al-Qaeda, then quickly discounted, and the perpetrator tagged as ‘just another’ psychopath.. But what exactly is their motive? As the madman begins bargaining with the hostages and killing those he sees fit one by one, the survivors release is reliant upon the hostage negotiator getting the info she needs from the TRN news channel. But can she get the answers she so desperately needs before they all run out of time and die at the hands of the mad person holding them. One things for sure, Hollywood may never be the same again. 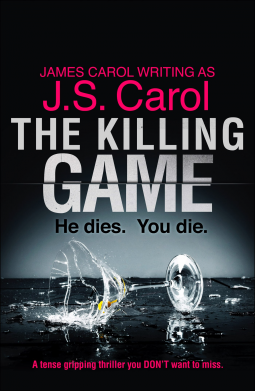 The Killing Game is available to buy now via Amazon online.